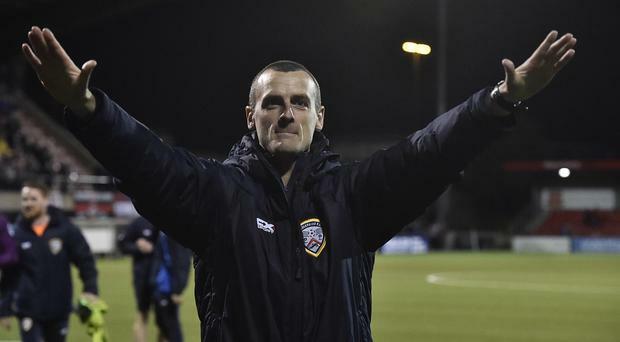 Oran Kearney delivered a fantastic interview for the St Mirren manager's job - in June. Three months later, the Scottish Premiership outfit have realised they should have offered him the job back then. On Monday, as Kearney's Coleraine were defeating Crusaders 3-0 at Seaview to go top of the Danske Bank Premiership, St Mirren were sacking Alan Stubbs, the man they had chosen ahead of the Bannsiders boss in the summer. The Buddies had opted for the ex-Celtic player and former Hibs boss due to his experience in Scottish football. Four league games in, the last three of which ended in defeat leaving St Mirren second bottom, Stubbs was dismissed. Asked about the possibility of St Mirren making a move for Kearney, the Showgrounds supremo wisely stated he would keep his powder dry on that one as he didn't want to take anything away from what was a sensational Coleraine victory. It didn't take long for St Mirren to get in touch. The Scottish club's chief executive Tony Fitzpatrick contacted Coleraine chairman Colin McKendry yesterday to seek permission to talk to Kearney, who is under contract with the Bannsiders. McKendry, who kept faith with Kearney a few years ago when some fans were calling for his head, gave that permission and last night was hoping that his manager would turn down the offer coming his way from St Mirren. It was Michael O'Neill who first drew St Mirren's attention to Kearney. The Northern Ireland boss told key figures at the club that the 39-year-old ex-Linfield midfielder was one to watch. When Jack Ross decided to move on from Saints to Sunderland in the summer, Kearney was invited to an interview in which his presentation went down a storm. Kearney threw everything into that interview. He even contacted Celtic boss Brendan Rodgers and Hibs counterpart Neil Lennon as part of his research. While initially disappointed not to be offered the role, he was delighted to have had the experience and Coleraine were joyful he was still in their dug-out after the success of last season. The Bannsiders took Crusaders all the way in a thrilling title race before losing out on the last day, but picked themselves up a week later to win the Irish Cup final against Cliftonville and claim the club's first major trophy in 15 years. Kearney running down the Windsor Park touchline after Eoin Bradley netted Coleraine's third goal in their 3-1 success was one of the sights of the season. He has done a spectacular job at the Showgrounds. There is a sense, though, that it is unfinished because with the squad assembled by Kearney they could go one better and win the Irish League crown this term. They showed their qualities with that 3-0 romp away to Crusaders earlier this week. Kearney is happy at Coleraine, he has just started a new school term in his role as a teacher and has a young family with wife Lauren, who is daughter to Derry City boss Kenny Shiels. Oran also happens to be ambitious, and there is obvious appeal in taking on the likes of Rodgers, Lennon, Steven Gerrard, Tommy Wright and Stephen Robinson in Scotland. St Mirren's next game is at home against Celtic on Friday week. What an introduction that will be for their new boss. If Kearney leaves Coleraine, it will be one almighty hole for the Bannsiders to fill.